I spend three hours getting dressed as Elizabeth I. 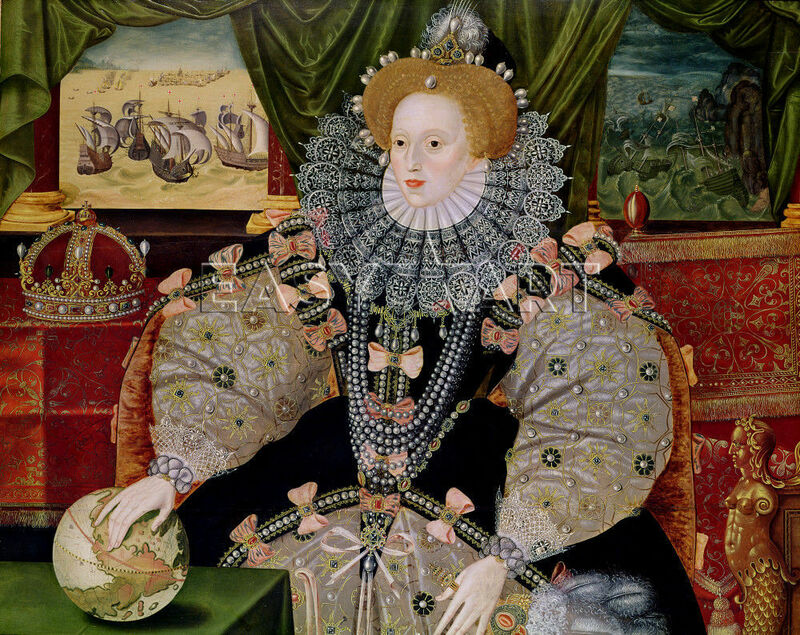 How did Elizabeth I get dressed? I wanted to know! There’s no doubt that the queen had quite an extraordinary shape, if the portraits are to be believed. 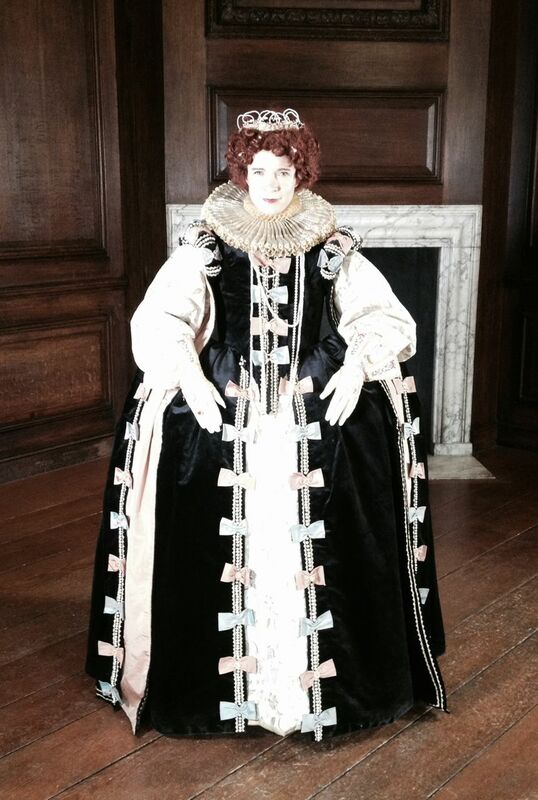 If you visit a Historic Royal Palace it’s quite possible that you’ll see an Elizabeth I wandering round in a replica of the dress you can see in the ‘Armada’ portrait, made in celebration of her victory over the Spanish in 1588. The replica was made by, and is worn by, members of Past Pleasures, the company of performers led by Mark Wallace, who helped me to experience for myself what it was like to get dressed as the queen. Firstly, the time it took! What a palaver. I don’t think you could do it in much less than an hour, and certainly you couldn’t do it without help. The starting point for the costume is a modern copy of a genuinely wonderful historic artefact: the set of stays or ‘bodies’ that were made for Elizabeth I’s funeral effigy immediately after her death in 1603. This effigy, seen here to the left, still remains at Westminster Abbey. It was carried in her funeral procession, dressed in her robes, its wooden face painted so realistically that she almost looked as if she were still alive. (You can see the effigies of lots of other medieval and early modern kings and queens at Westminster Abbey too.) 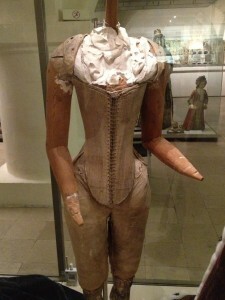 So the set of underwear the effigy wears here wasn’t actually worn by the queen, but it’s the next best thing. Pretty much all the stays worn in films and by re-enactors are copied from this really remarkable survival. On top of that basic foundation comes a big velvet bum roll. Imagine a travel cushion big enough to go round your hips. Tied at the waist, it then supports a set of wooden hoops called a farthingale. The oval-shaped willow hoops sewn into a skirt will eventually support the immense width of the queen’s dress. 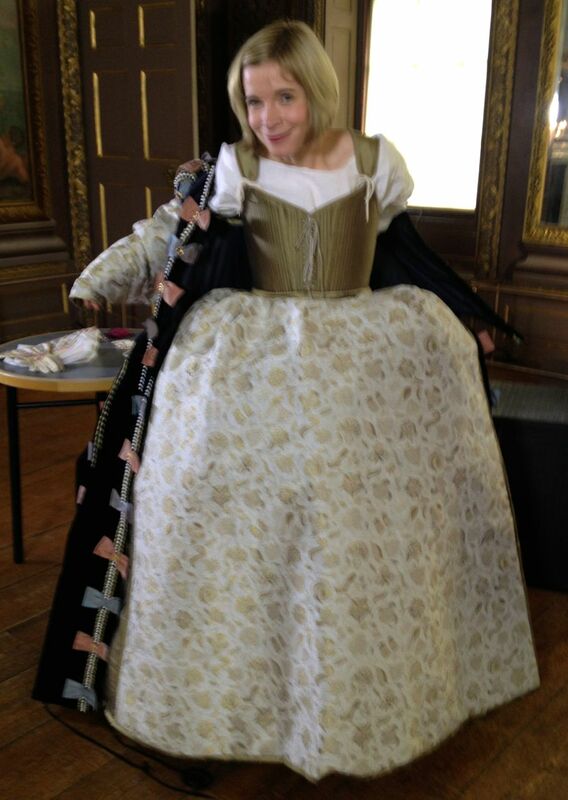 Here Mark’s about to put me into the petticoat, which is a satin skirt that fits exactly over the farthingale. The petticoat has fancy embroidering, but only at the front, because that’s the only bit which will show under the gown. The next, and outer, garment is the black velvet gown with long trailing sleeves. Sewn with pearls and decorated with apricot bows, it was very snug, and I imagine it was quite cosy in a draughty old palace. However, it was also extremely heavy, and in it I couldn’t sit, only perch on a wide window cill. Once I was done up in my ruff, pearl necklace, red wig and gloves, I was pretty immobile, although I could glide along with a stately strut. The hoops gave me enormous physical presence, though, and nobody could stand near me and encroach upon my dignity. Also, as Mark said, stately is good: I would have absolutely no need to hurry. Running was for servants, not for the queen. And then, disaster. Once I was entirely imprisoned in all these clothes and we were ready to start filming, the battery in the powerpack for my microphone ran out. Our sound recordist had to carry out a mini-archaeological excavation beneath the layers to get it out from the belt I was wearing underneath absolutely everything else. I wish the Elizabethans had thought up a more practical solution to that particular problem! I don’t know what she does to the Spanish, but by God, she frightens me! It’s a pity they didn’t invent roller skates too! I can’t wait to se the film! I have to say you look very fetching in the shift. The things one has to do for Showbiz ! It would seem the phrase dress to impress was invented for her late majesty! Looking forward to the programme. Your gift is to entertain and educate at the same time. Miss Lucy, I think you’re rather wonderful ! Nancy & I tell all our friends how delightful Lucy, the “History Pixie”, is.